For thousands of years the nomadic Innu lived off the land. In the 1960s, government policy forced them to settle and form communities in Labrador and Quebec. Ancestral ways collided with modern ones, and gave rise to ongoing struggles. Now the grandchildren tell their own story. Six savvy, gutsy young people talk to Montreal filmmaker about addiction, suicide, lack of jobs, hopelessness. Interviews with Elders, grandparents and teachers round out this portrait of a community in crisis - sadly a situation not unlike that of many other aboriginal nations. What is remarkable about Innu youth is their love of the land and of their native language. For them, being Innu means finding a balance between the traditional ways of the past and today’s reality. 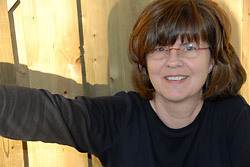 A thirty-year veteran of the Canadian film industry, producer-director-writer Catherine Mullins heads Montreal-based Green Lion Productions which she founded in 1989. Before launching the independent production company, Catherine Mullins spent 17 years at the National Film Board of Canada where she honed managerial and filmmaking skills eventually producing the award-winning Gwynne Dyer mini-series Defence of Canada. Other distinguished and prize-winning documentaries produced by Mullins include Green Lion’s mini-series The Human Race – a species at the crossroads; Untangling the Mind – the Legacy of Dr. Heinz Lehmann; and Their Brothers’ Keepers – Orphaned by AIDS.